Aaron Gillespie, frontman of The Almost and former drummer of Gold®-selling and Grammyreg;-nominated artist Underoath, has sold nearly 1.7 million records over his illustrious career. The Almost released their highly-anticipated third album, Fear Inside Our Bones, April 9th, 2013 on Tooth & Nail Records. The Almost's debut album Southern Weather, which featured the single "Say This Sooner" sold over 240,000 units and earned the band a spot on the Vans Warped Tour to rave reviews. Gillespie has proven himself as a multi-instrumentalist, and backed by guitarist/background vocalist Dusty Redmon, guitarist/background vocalist Jay Villardi, drummer Joe Musten, and bassist Jon Thompson, The Almost is a force to be reckoned with. Fear Inside Our Bones, produced by Marshall Altman, was written over the course of a year and proves that The Almost have not lost their touch as leaders of innovation in alternative rock. Fear Inside Our Bones is collecting early praise from rock critics. Revolver magazine declared, "Candid lyrics like this paired with the band's decision to record completely live make for its most raw and organic album yet. 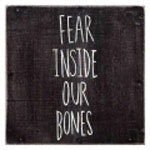 Fear Inside Our Bones delivers thundering rhythms and crunchy guitars fans will love, at times even tapping into the pop-rock effervescence of the Foo Fighters" (April). Elsewhere Alternative Press hailed, "On the Almost's first album in nearly four years, Aaron Gillespie and his bandmates fire up the Wayback Machine to the '70s, employing fuzzed-out rock 'n' roll that's big on bluesy licks and light on studio magic. There's a visceral energy to "I'm Down" and "Never Be Like You", the result of the Almost tracking these songs live and in rapid-fire fashion, and the title track might be the darkest song Gillespie has penned in quite some time." The album's first single "I'm Down" impacted Alternative and Rock radio in May 2013.